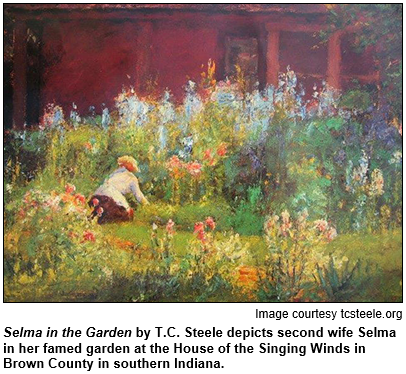 You already may know about the most famous painter from Indiana, T.C. Steele, who won widespread acclaim for his landscapes, particularly of scenic Brown County. But how much do you know about the two wives who were, in different ways, so influential in the life and work of the Hoosier Group artist who died 90 years ago this month? 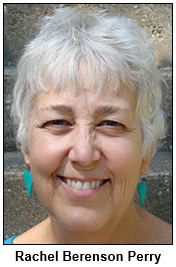 To share insights about Libbie Lakin Steele and Selma Neubacher Steele, acclaimed author Rachel Berenson Perry, the fine arts curator emerita for the Indiana State Museum, will be Nelson's studio guest. 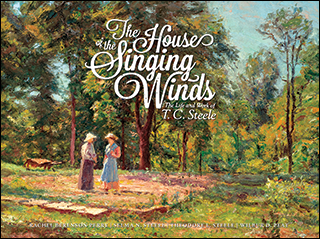 Rachel has written an introduction about Selma for the newly released House of the Singing Winds: The Life and Work of T.C. Steele, a lavishly illustrated book that the Indiana Historical Society originally published 50 years ago. Rachel also is the curator for an extensive exhibit of paintings by Steele (1847-1926) at the Eugene and Marilyn Glick Indiana History Center; several of the paintings are from private collections and never have been seen in public before. The special exhibit, Indiana Impressions: The Art of T.C. Steele, runs through July 9. In the new version of the book - which also features an account by Selma of her challenges in moving with her husband to rustic, isolated Brown County during the early 1900s - Rachel calls Selma "the unsung heroine of her artist husband's legacy." Even today, at the couple's restored hilltop home studio (which he called the House of the Singing Winds), now the T.C. Steele State Historic Site, Rachel notes: "Potable water continues to be problematic, flooded roads are a seasonal headache, and building maintenance is a perpetual conundrum." The beauty of the area - which Steele depicted in landscapes now cherished by collectors - is undeniable. Before his renown as a landscape artist, though, T.C. Steele (full name: Theodore Clement Steele) was in demand as a portrait painter, the source of his acclaim for many of the years he was married to Libbie, his first wife. Steele painted portraits of most of Indiana's most prominent residents of the era, including President Benjamin Harrison, poet James Whitcomb Riley, Col. Eli Lilly and retailer Lyman S. Ayres. Libbie Steele, who died of tuberculosis at age 49, was the mother of the couple's children, Brandt, Daisy and Shirley. The children were under 10 years old when Libbie coped with raising them overseas; that's because T.C. Steele was studying at one of the world's top art schools, the Royal Academy of Art in Munich, Germany. Rachel describes Libbie as a "kindred spirit, nature lover and critic of his paintings from the beginning. Though not an artist herself, (she was) very tuned into his muse." Steele was born near Gosport and grew up in Waveland in west-central Indiana. For most of his career as a portrait artist, he was based in Indianapolis; second wife Selma got her first look at their Brown County home shortly after their wedding. Before that, Selma had been a teacher at Indianapolis Public Schools, Rachel notes in the introduction for the rereleased book about T.C. Steele. 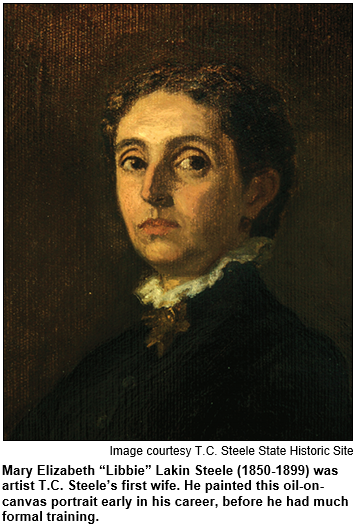 Selma also toured Europe and taught at what was then known as the John Herron Art Institute. 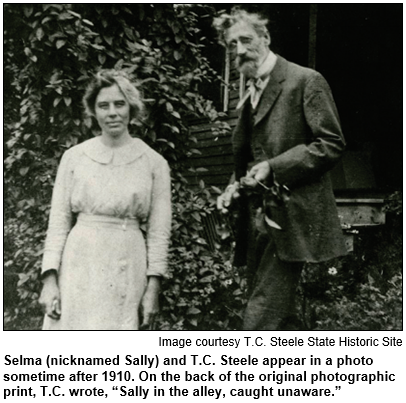 After she married Steele in 1907, the couple moved to the House of the Singing Winds, which he had built on 60 hilltop acres near the Brown County town of Belmont. At the House of the Singing Winds, gardening and landscaping became Selma's passions. That inspired her husband to paint garden subjects and still lifes of floral arrangements. Despite the challenges of what Rachel describes as a "profound cultural divide" between the Steeles and their rural neighbors, many of whom were illiterate, Selma Steele was driven by a "social conscience" to address harmful and unjust conditions, as well as to preserve the area's forests. During our show, Rachel will share insights about the ways Selma, who outlived her husband by nearly 20 years, strived to ensure his legacy. Rachel's books include a biography written for young readers, Paint and Canvas: A Life of T.C. Steele (IHS Press, 2011). She was a guest on Hoosier History Live in 2015 for a show about the life of Steele's Hoosier Group colleague William Forsyth. Rachel is the author of William J. Forsyth: The Life and Work of an Indiana Artist (IU Press, 2014). 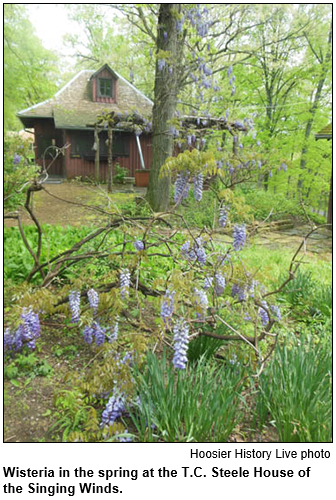 William Forsyth's colorful life, plus Portfolio Club history - Hoosier History Live newsletter for Jan. 17, 2015 program. Indiana Impressions: The Art of T.C. Steele - Indiana Historical Society exhibit and book description. On the road with T.C. Steele - Indiana Historical Society story about traveling the state of Indiana collecting the art of T.C. Steele. Interview with Rachel Berenson Perry by Ray Boomhower of the Indiana Historical Society. Guest Roadtripper and architectural historian William Selm will focus on the National Road (U.S. 40) from Indianapolis to Richmond in the eastern part of the state. The road arrived in Indiana in the 1830s at the beginning of the Canal Era, before the coming of the railroads. Expect Bill to talk about the numerous small towns spawned by the road, such as Knightstown, where the road became Main Street. And Cumberland, Greenfield, Knightstown, Centerville, Dublin, East Germantown and Richmond are just a few of these National Road towns that you'll find as you head east. Hear more on Saturday on the radio! Before T.C. Steele became renowned primarily for his landscape paintings, he painted the portraits of many of the most famous Hoosiers of his era. His portrait subjects - in addition to President Benjamin Harrison and poet James Whitcomb Riley - included one of the five U.S. vice presidents elected from Indiana. This vice president was a Republican who had been a wealthy attorney in Indianapolis. He was vice president from 1905 to 1909, serving under a U.S. president with whom he had a chilly relationship. The vice president died in 1918 and is buried at Crown Hill Cemetery in Indianapolis. Question: Name the vice president whose portrait was painted by T.C. Steele. 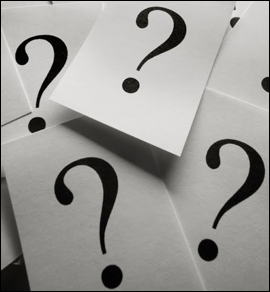 Please do not call in to the show until you hear Nelson pose the question on the air, and please do not try to win the prize if you have won any other prize on WICR during the last two months. You must also give your first name to our engineer in order to be placed on the air. The prize pack includes two admissions to the Indianapolis Museum of Art, four admissions to the Indiana Experience at the Indiana History Center, and a gift certificate to Bee Coffee Roasters, all courtesy of Visit Indy. For nearly 55 years, the Latvian Community Center has been a landmark on the northwest side of Indianapolis. In fact, some of the other ethnic heritage groups featured in our rotating series on Hoosier History Live have their monthly meetings at the Latvian center, 1008. W. 64th St. So isn't it high time we spotlight the heritage in Indiana of the three Baltic countries: Latvia, Lithuania and Estonia? Our rotating series about immigration and ethnic heritage already has explored the impact in Indiana of more than a dozen groups. Shows have focused on Scottish, Russian and Cuban immigration, as well as Italian stonecutters, Swedish and Norwegian heritage and even Sikh heritage in the state. This time around, Nelson's studio guests will include Laura Bates, a Terre Haute-based author and English professor at Indiana State University whose parents fled Latvia as refugees after World War II. "They came to this country with sponsors who provided work and housing," Laura reports. "My mother was a caregiver for an elderly couple, and my father was a dishwasher in a hotel restaurant. My sister and I learned Latvian before English, we always spoke Latvian at home and we attended Latvian school and church." In Indianapolis, Andris Berzins, president of the Latvian Community Center, also grew up as the child of two immigrants. Although Andris, who was born in 1968 and works in the insurance industry, is a graduate of North Central High School and Indiana University, he also attended Latvian school, a Saturday school that still continues. In addition to learning the Latvian language, students are taught the culture, geography, grammar, music and traditions of their ancestral homeland. Andris, who also will be a guest on our show, attends the Latvian Lutheran Church, a congregation that meets at Pleasant View Lutheran Church on West 73rd St. According to Andris, about 80 percent of Latvians are Lutherans, and 20 percent are Catholic. In contrast, Lithuanians are about 80 percent Catholic, according to several sources, including Sigita Nusbaum, past president of the Indianapolis Lithuanian Community. After graduating from college in Lithuania, Sigita, 42, came to Indiana under an exchange program. Sigita, who will join Nelson in studio, lives in Fishers and owns Delaney Window Fashions, a custom drapery business. Immigrants from Latvia, Lithuania and Estonia tended to arrive in two or three waves, according to Peopling Indiana: The Ethnic Experience (Indiana Historical Society Press, 1996). The first wave, during the late 1800s and early 1900s, consisted of immigrants seeking upward mobility. The second followed World War II and included refugees who refused "to return to communist-occupied or dominated homelands." For centuries, the Baltic people often were ruled by powerful neighbors, including Germans, Russians, Poles and even Swedes. In 1918, following World War I, all three countries declared independence, only to be overrun during World War II and eventually absorbed into the Soviet Union. With the collapse of the Soviet empire, the three Baltic countries regained independence in 1991. Peopling Indiana notes that, during the early 1900s, Lithuanians developed "active colonies in the Calumet Region" of Indiana thanks to jobs at the steel mills and other booming industries; many relocated from Chicago, Pittsburgh and other cities to northwest Indiana. During the last 30 years, Lithuanians who have settled in central Indiana have tended to be college-educated professionals, according to our guest Sigita Nusbaum. She said the Lithuanian heritage organization in central Indiana is one of 56 across the country, with groups in Chicago and northwest Indiana among the largest. Our guest Laura Bates is working on a book drawn from the hundreds of letters and journals written by her Latvian parents. Several ethnic heritage groups - including Estonians, Latvians and Lithuanians - host an annual Midsommer Festival at the Latvian Community Center. This year's festival on June 25 was attended by more than 400 people; the event evolved from ancient celebrations of the summer solstice. Hoosier History Live newsletters for our shows about Irish, Scottish, Cuban, Colombian/Venezuelan, Russian, Italian, Swedish and Norwegian, Sikh, and Persian/Iranian immigration. Video, Lithuanian Dance Festival in Boston, 2012. © 2016 Hoosier History Live! All rights reserved.